Bill Cosby departs a pretrial hearing in his sexual assault case at the Montgomery County Courthouse, Tuesday, March 6, 2018, in Norristown, Pa.
People attending Bill Cosby's sexual assault retrial won't be allowed in with T-shirts, flowers and other items that show support for one side or the other. The trial judge issued the ban Thursday. 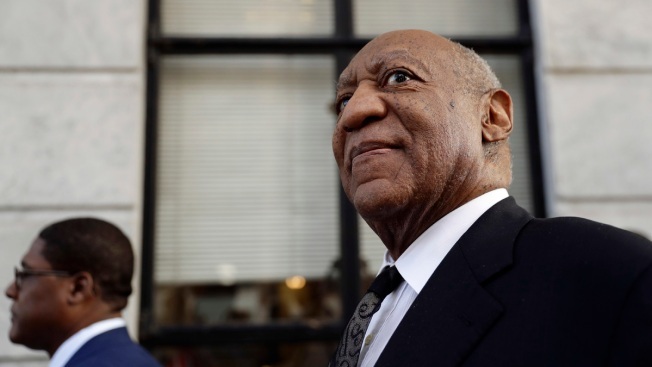 Cosby's lawyers argued the items could influence jurors. Some of Cosby's accusers wore "We Stand in Truth" badges to the first trial. Others carried bouquets of pink gladioli to express solidarity with the many women who say the comedian had drugged and molested them. Cosby has pleaded not guilty to charges he assaulted a woman at his suburban Philadelphia home in 2004. It's the only allegation against him to lead to criminal charges. His first trial ended in a hung jury. Jury selection in the retrial starts April 2.